This is the release of our Search Explorer Alpha (release 0.3) that I expect will really interest the SEO industry, because today we unveil our live rank factors for search engine! Now when you type a search phrase into our search engine, not only do you get search results, but you will also get an increasingly detailed view of how, and why, we ranked the results. No more guessing for SEOs. From here on in you could do SEO without Majestic, but as we improve our search algorithm why would you want to, when SEO WITH Majestic Search gives you transparency at your fingertips? 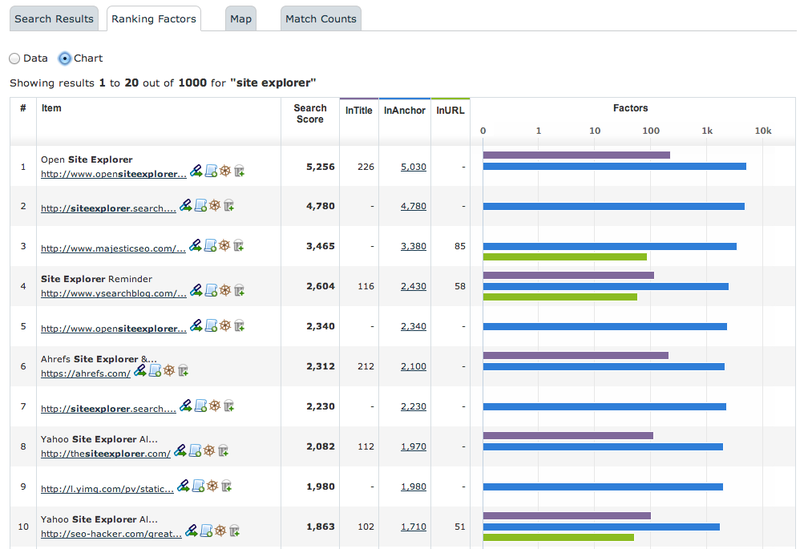 The figure above shows the chart view of the Ranking factors in summary mode for the phrase “Site Explorer”. The URLs listed are the SERPs; (Our own SERPS, NOT Google’s), and then in the next column we show the overall search score. This number is made up of our interpretation of the search factors we are using to rank each result. We then show you the relative weighting of the results between InTitle, InAnchor and InURL factors. You will see a coloured bar above each of these columns, which correspond to the bars on the right of the screenshot. The example is an interesting one, because – of course – Yahoo’s site explorer, which comes in at position 2, does not exist but was the “original” and probably still the most famous “Site Explorer”. The chart has a few clues as to why it still ranks. We’ll dig into that a bit further. This more granular approach to showing you data is also shown in our search results page, showing the main search score factors in the SERPS themselves, along with the Flow metrics, referring domains and external backlink counts to give you a really good feel for why we interpreted one site or page to get listed above another. Clicking on the inAnchor numbers gives you a quick way to dig into a result. One clue as to why the Yahoo URL still ranks lies in the ysearchblog result (number 4) where we see many pages on this active blog also talking about Site Explorer and linking through to the page. http://siteexplorer.search.yahoo.com/ also remains a valid page, and that page ALSO links back to the Yahoo blog. The main new tab – the Ranking Factors tab – actually has two modes – chart mode which you saw at the top of the post and “data” mode. By flipping to data mode you get more detail – particularly in how we have broken down the in URL factors into separate elements for scoring purposes. Does this Change the SEO Industry? I really believe that this is the start of a different approach to SEO. In some ways it is a return to analyzing ranking factors – but now, for the first time, you can run a search query and then see EXACTLY why one search result appears above another. One might argue that these results look very different to Google’s – but providing Majestic’s search engine starts to provide more and more RELEVANT search results, this is going to increasingly become a strength for SEOs, because it provides relevance based on a clearly defined set of variables. If a search engine chooses other factors (which of course they will) then where there is a large deviation, an experienced SEO will easily spot the differences. Whether Google decides to insert personalized results, localized results, social results, paid feeds or unpaid feeds, these all serve to add clutter and confusion for the SEO. If Majestic SEO IS using a ranking factor (such as InAnchor or InTitle) then we will aim to show you. Where we aren’t, you will be able to confidently predict that other results in search engines are ranking due to non-link related factors. As Majestic strengthens its search, we plan to increase the number of factors that we are using in our search engine. The obvious ones to start integrating next are our Flow Metrics which are already on the screen but not yet being used in our scoring on this release. How do I use this? Give me a use case scenario! All you would do is type “Cheap Flights” into our search. This is a BIG term, so whole businesses are built around such phrases. In this instance, switching to the DOMAIN view (as opposed to the URL view) gives the best results. Tip: If your search query does not instantly return any results, do not despair. We are building up our search rankings “dictionary” not based on pre-guessing every search term, but by calculating our rankings based on what users search for on our engine. So if you type in a term we have not yet calculated rankings for, we will take that as a signal that you are interested in the term and will look to populate the SERPs over the next 24 hours. Once we have results, we will continue to be able to show them to you at speed. Assuming there ARE results for your chosen search phrase, then the next question is whether your target landing page is already within our search results. Right now, whilst we are ramping up, we are showing you the top 1,000 search results… as much as any other search engine… but we may go deeper for higher subscriptions in the future. If your site (or your client’s) is not listed within our top 1,000 results, then it honestly doesn’t matter WHAT you do to increase the importance of your site – as long as you do SOMETHING logical – get your site noticed by an industry pundit somehow… or write a thought leadership piece on a respected industry site… whatever you do, you need to get enough links and gravitas to get into the top 1,000. From there, you get to see your site’s current “Search Score”. You also get to see the scores of everyone above you. You do not necessarily have to scroll through every page of our SERPs, because you can just export the data from right there of the screen into a CSV or Excel file. This means you can see exactly the sorts of things that WE think are important and you can see where your site need to improve (and by how much) to have a chance of ranking in our SERPs. In a perfect world, as you improve your rankings on our engine, you will see corresponding improvements on other search engines… but a word of warning here. It might be easier to “game” our search results then the other engines, but in doing so you are only fooling yourself and setting up big red flags for the major engines to latch on to. Improve your site’s web presence using sound marketing ideas instead of gaming the system if you want to see a sustained improvement not only in our SERPs, but also in your vertical and other engines at the same time. If your site appears on OUR search very highly, but does NOT appear highly in Google or Bing or Yandex or Baidu’s search results, then this tells you that other factors are dominating the search rankings for the chosen keyword. It means that getting more links possibly won’t help you. You need to focus your SEO efforts elsewhere. Now – instead of running a search against EVERY site on the internet, you can run a search only for URLs in your bucket list! From there you will be able to see exactly what you need to do to improve your lot in OUR SERPs to improve against your competition. To do this, type “credit cards” in the search box in Search Explorer, NOT the home page, then select “advanced” and up comes an option to only search within your bucket! 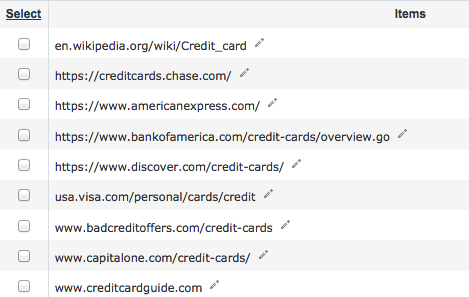 Tip: Do NOT mix domains and URLs when you carry out this sort of search. The Flow Metrics for a Domain are INDEPENDENT to the Flow Metrics for the URLs. Complex maths… In fact I would recommend that you search at the URL level. To make sure all your bucket list items are at the URL level, you can simply view you bucket list. Any that say “sub-domain” or “root” you can fix by clicking on the edit pencil and append a trailing slash (/) and this will change the bucket item to a URL level item. The result is not JUST a list of sites… but a list of sites that are likely to be influential around the phrase “flights” AND are on blogs and sites that you know may be approachable. Just go down the list and click on the “bucket” icon ( ) every time you see a viable candidate. You can then curate or export your bucket list from the Bucket List link at the top right of your screen. Tip: We consider multiple keywords as an “OR” for site: searches, so you can look for synonyms at the same time. Will doing all this guarantee Google Rankings? No – of course not. We do not have the same ranking factors and we do not even “see” Google’s ranking data, though any correlations by third parties could make a great research study and blog post, but our data is our own. Google also uses many other factors other than the ones we use, but where a site ranks BECAUSE of factors that we use, then by the same token you should get a good idea of how your site needs to progress. Won’t people scrape this data from you? Platinum users will soon be able to see this data in their API documentation. We’ll blog about that when we can. We plan to make it practically easier for you to either download CSV files or use the API than scrape our results. Scraping our SERPs will result in immediate suspension and possible prosecution if we find you, so please do consider paying for Platinum access if you want our data for whatever reason… it will be less expensive for you in the long run and we will continue to be able to provide a robust service for our users. Platinum users also have the opportunity to build OpenApps applications. OpenApps is a proprietary technology developed to let you build third party applications that ANY Majestic SEO subscriber can plug into. All in all, using data the right way is better than trying to take it the wrong way. Is your Search Engine JUST for SEOs? Majestic has not increased its prices in any way with the advent of Majestic Search Explorer, at least whilst it is in Alpha. Sign up for a paid subscription now and see exactly how we rank searches. Welcome to the next level! I tried this but it is not showing data for all the keywords and also the ranking data it is showing is old. 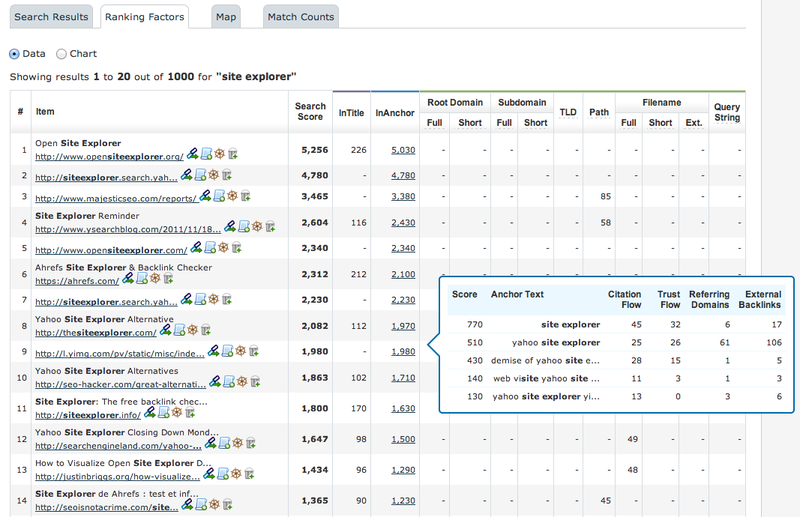 MajesticSEO calculates rankings on the basis of Anchor text, url only? I mean there are other ranking factors too, but their score is not explained here. Thanks for adding this nice and innovative feature in MajesticSEO, it’ll help webmasters alot in understanding competitors and competitors work. Thanks for the feedback. The Freshness of the data depends on your persoective. Here’s a search showing news sites reporting on Nelson Mandela’s death for example… so the data is certainly plenty fresh enough for SEO. However – the search dictionary develops intelligently, so when you search for a term that isn’t there, it is because we have not yet worked out the rankings for that term to be able to give you the results fast – but just by you entering the term into our serach engine indicates that you want data on that term, so come back in 24-48 hour and you should see the data you are looking for. Wow – this is fantastic tool – always like what you guys at MajesticSEO do – from your first release nothing but great things! Thanks. Have you had any thoughts as to how you’ll use it yet? We’d love to hear feedback. Hi is this just for US rankings or is there a way I can set it to my countries location? Thanks! We plan to add ability to specify location of the country very soon, at the moment there is no geographical bias in ranking. Enjoying Majestic SEO service for a couple of years. These kind of feature makes Majestic SEO tools more unique and usable than other competitiors. Loving these new features. Well done M team! You’ve clearly been working hard on this. In terms of changing the way we do things, I agree this could well be the start of great things. I for one really appreciate the ‘cheap flights’ example. This is very good work as at majestic website analysis and SEO are always one of world’s best. We do not provide individual consulting advice I am afraid. We are a data provider only. If you pay me, I will do all those keywords and plus #1 for you in Google. Excellent features, one of the great MajesticSEO! Awesome! This new ranking factor will help us to eveolve the best results in Search engines.. Great work! An interesting feature to be added to the exceptional functions Majestic already seo offers. My compliments! Fantastic feature and excellent article. I look forward to using it. Absolutely useless if you are outside the USA unless I am missing the option to choose a territory? We are working on that. We needed to get this out as a first step. Here is a search in Japanese for the equivalent of “credit cards” We are working on a territory parameter – but our data is world focused not US focused. Indeed, we do relatively little crawling form the US as we are UK based. We do, however, also plan to increase data on foreign language keywords. Using our engine creates the interest for that phrase and instructs our system (automatically) to work ouf flow metrics at the keyword level for that phrase… which will take a day or so but thereafter will be automatic. I use Ahrefs for now, but I like what you are doing with Majestic SEO lately. My annual plan expires in a few months, and you have just given me a powerful reason to make the switch. Glad you like it Terry! We are not about to automate something that requires us to do a Google SERP lookup – because we don’t want to start creating a row with Google and we like our own data to be unquestionably our own (not theirs), but if you have a list of URLs (from any source) then we have our bulk back link checker, which we could potentially upgrade to include search scores if there was enough demand. Nice idea actually. I also am hoping that one or more of our premium partners will look at developing something along these lines. When we are a BIT more happy with the output, then we plan to launch the API for this as well, which would enable others to build things like that. Great reading and always a pleasure to know new items coming into effects from you guys. I’ve had a quick play with it this morning, but the search score returned has very little overlap with Google’s search results – which seems to limit the value rather? We had to build the system first before we could start modifying our algorithm. Now the work will be to improve the quality of the results – but there’s an important note to reiterate here… we are not trying to “copy” the Google results. We are trying to provide relevant results and then show you WHY one site is so much more relevant than another for a given phrase. The insight should be more “ground up” then comparing with individual Google results… but that said I am not going to be unhappy if our results start to resemble Google’s opinion of “relevancy”. I can’t think of a better benchmark… except maybe Bing on the basis that Bing is NOT Google and may not mind us comparing so much. That said, pure SEO is 95% about Google right now. There are other benefits to what you’ve done with this tool, but until the ranking factors have a more true-to-life relevance, it’s totally incongruous to call it a “search score”. I’m guessing you’re aiming for something a bit like the Moz keyword difficulty tool. What they’ve got is a long way ahead of this at the moment though I’m sorry. Thanks for the reply. I don’t think we are going in the same direction as Moz’s keyword difficulty tool… although I would imagine you will be easily able to do something similar with us and indeed you can now. One of big differences between us and Moz under the bonnet is that Moz collects ranking data in Google – which SEOs very much want and is very useful – but which we never attempted for several strategic reasons. Our objective was always to work towards search, and indeed we created a full text search engine back in 2005, but quickly realized that the limiting factor on relevancy was the scale of the crawl / URL discovery and the subsequent interpretation of those interrelationships. Although for SEOs in particular, the problem is 95% about Google (at least in the West… not so much in China) – Internet Marrketing as a whole is not about Google – but about building an online brand. But I take your point and you most CERTAINLY will be able to use what we are building for pure SEO, which I am sure will become increasingly apparent as we improve our search score and roll out new functionality in 2014. I have been remained a big fan of Majestic Site Explorer, and now I think that this is another next big thing MajesticSeo have made. Great work, highly appreciated. After using this new tools over and over again I did not have any accurate result at all. Unless if i am doing something wrong. Type on Google search bar”Bali silver jewelry or Balinese silver jewelry” than use same keywords with this tool and you will see entirely different results. Isn’t this tool results spouse to match with search engine ranking! Am i missing out something in here? 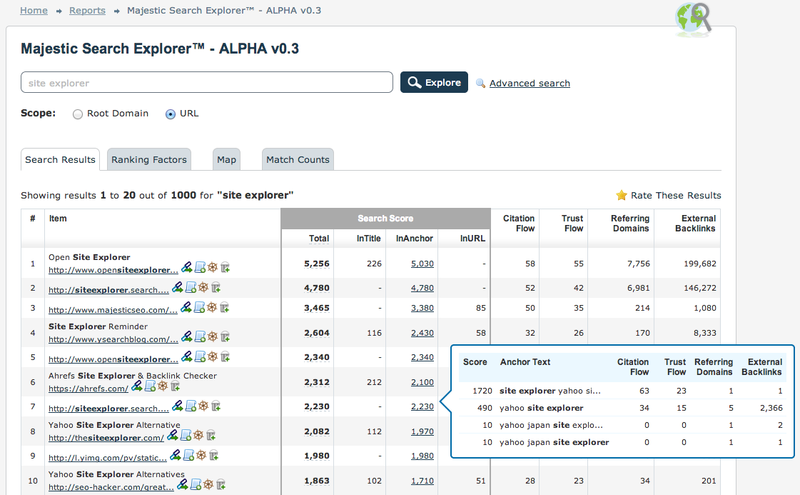 Search Explorer is still in its infancy. We had to build the technology for ourselves before we started playing with the algorithm. Now that we have a system, then we are encouraged that “head” search terms (big ones like Credit cards and cheap flights) return realistic looking results, but you will not yet get sensible results out of the box for mid and long tail searches. Indeed, we are not yet designed to handle location based searches (although that is coming soon). But more importantly – we only started with a search dictionary of a few hundred million search terms – but we also built the system so that when you type in a search term, we use this as a signal to note that you are interested in us working out the metrics for this term. So come back in a few days and you will already see stronger results for “Bali silver jewelry” (I hope!) :). This approach now let’s us work with the SEO community to decide on the best way to weight our ranking factors moving forward. our next task is location based search bias – and then probably after that we will have a go at improving the relevancy further. Thanks for the prompt reply Dixon. Actually results are showing in your serps, but not same as Google. In my knowledge after reading your wonderfully written article I am honestly fascinated with scientific calculation like this to show only and only quality results but nothing else at all. Well, I am not going to keep it to myself, but this tools results made Google looks like apprentice in the game. Because they are yell and scream out for quality and quality but according to your SERPS results actually not Quality at all for Google. Also I have to admit this, after starting to use Majestic SEO, every Google zoo changes brought my all clients website ranking up. I wish they run those Google animals around more often. Because of the Majestic SEO toll my seo service become Google bullet proof. algorithm all that and apply to their system ? I do hope your system is well protected for that to not end up like I phone. Your tools for SEO pros must have tools. I tried almost all of them but nothing comes near Majestic. Thanks again for the whole Majestic team for providing beyond imagination SEO tools. Thanks for the kind words about Majestic SEO! This is interesting! We may compare the search results from MajesticSEO and Google to find out the “website quality” score (which many believe an on-page/user experience factor introduced in Google Panda). Great Job! Good Update – but I will be a little critical in my feedback. 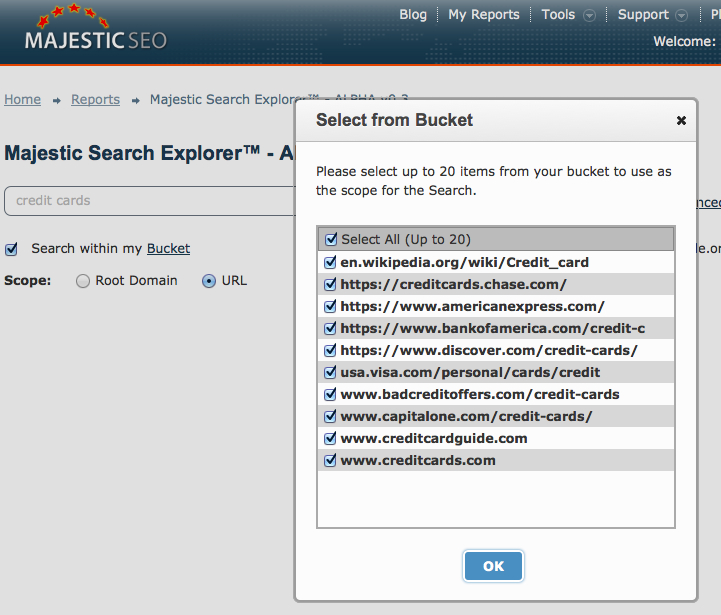 What “Majestic” has really build is ranking data – based on limited on-page factores but largely on “backlink” factors. No harm in doing so. But SEO,as an industry, revolves (mostly – if not 100%) around better rankings in Google – and Google has it own unique way of analyzing “backlink” data – far more different and advanced (if not superior) than this (majestic’s). So even if Majestic’s scope is not – replicating Google’s algorithms – it should help SEOs, atleast, in understanding Search Engine’s (Google & Bing) contemporary approach towards rankings. Otherwise, for expert SEOs it has not been a major issue to just analyze backlink data. It is the Search Engine’s contemporary approach (in a transparent way) that we (SEOs) wish to understand..
> Thanks Mohsin, for pitching in. The on page factors and user intent are two other large technical problems, and the storage associated with a proper search engine – but there are already several other technologies and companies working on these areas, but (at least according to log data that we see) very few businesses in the world have created crawlers with the scale of our bot. So cracking this part of the problem first has been about 9 years in the making..
To your point: “[MajesticSEO] should help SEOs, at least, in understanding Search Engine’s (Google & Bing) contemporary approach towards rankings.” I absolutely agree that this is something that our data needs to help with – but our first responsibility in this regard is to be custodians of the [link] data, not the guys that interpret every element of Google’s algorithm. There are a number of other large partners investing millions in trying to add a technology value layer onto our data to get you further towards the perfect toolset for doing SEO on Google. You can see a list of those wanting to be identifed here (the logos start rotating randomly after a few seconds). Of course – these are not free or cheap solutions (but some have low cost of entry points) but that in part is because of the cost of building the infrastructure to collect and interpret the data. That said – we will continue to do our part in helping you to have almost x-ray vision on rankings, and over 2014 I am confident that SEOs will find many ways to use the data and functionality we have and will continue to roll out. It is good to hear that Majestic “is” moving towards “that final goal” that I pointed out. On Google? Remarkably few these days. Even before they switched to secure results pages only, the “Keyword not provided” percentage was the clue. For most sites I saw, it had already got to above 80% of traffic from Google Organic as Keyword Not Provided – so I’ll say that I think AT LEAST 80% of searches now include personalisation, although one could easily argue that 99% do as geotargeting is a factor on almost every result, at least at the country level. This will be great for brand management!! I’m really excited to use this…however I think there will be quite the learning curve since there will be so much more data. Is this available on the free account as well? Top 10 results are currently available of free accounts. Full use is in the £30 a month package. Great job over there. You should adapt a “trial mode” for it, would really love to try it.